For those who have seen Iron Man and stuck around until the post-credit scene...you'll know a little something about Samuel L. Jackson's character, Nick Fury, and the organization he runs known as S.H.I.E.L.D. Marvel has been quite popular these past several years for their involvement in the epic film franchises like Spiderman, X-Men, and Fantastic Four. The only problem with them was that they were all liscensed out to different film companies so future cross-over movies were made difficult. This is why Marvel is now in direct control of their movies, financing and producing them on their own and only using other companies to distribute the films. Now that Marvel can control their own destiny, they have much more play in what cross-overs they can pull off. Which leads back to Nick Fury and the Avengers. Yes. There will be an Avengers movie. It's planned for 2011. Tony Stark will be making an appearance in next month's The Incredible Hulk, presumably to recruit the Hulk to the Avengers. The Hulk could then, in turn, appear in Iron Man 2...which has just been announced. Furthermore, Marvel is planning on releasing movies about Captain America and Thor, both main members of the Avengers along with Hulk and Iron Man. On top of all that, Marvel is also coming out with two new movies called X-Men Origins. The first will be about Wolverine's troubled past, the beginnings of his feud with Sabretooth, and his time involved in Weapon-X. It will see Hugh Jackman reprise his role as Logan/Wolverine. Some other stars involved are Ryan Reynolds as the sarcastic psychopathic mutant mercenary Deadpool, and Dominic Monaghan. Second will be a movie about Magneto and his history with Charles Xavier. The next few years are going to be excellent. URGH! I TOLD HIM we should stick around to see after the credits. BUT NO, my mate insisted that there wasn't going to be anything there. What unhappened to his eye? That's a picture from another of his movies. Not from Iron Man, lol. so...that picture...is it just luck that he and sam look alike or was that on purpose? They modelled the character on Sam Jackson, lol. Yeah, in one of the newest comic lines, Ultimate X-Men, they modelled the character after him, knowing that he would be in the film(s). Samuel Jackson: "That's one handsome mo'fo... Damn, now I have to take the part." Okay, so I was surfing IMDB and I found a list of curious movies with rather curious titles that really make me wonder! Plot:Partially disabled medical student Dr. Donald Blake discovers his heretofore unknown alter ego, the Norse warrior, Thor. Plot line--Uncertain. Casting? Only Tobey and Kirsten signed up so far. Wonder why. When Captain America is awakened from an icey prison, and some of the greatest evils earth has seen are born, the Avengers go into action. Captain America, Iron-Man, Hulk, Wasp, Ant-Man and Thor. Will they be able to stop the likes of Loki and the Masters of Evil? I trust Marvel on all of them except Spiderman 4. The first three were given over to another production company. If they bring it back in-house, there's hope. If anyone picks up The Incredible Hulk DVD, check out the deleted scenes. There's an extended cut to one scene where the General is talking to Blonski about how the Hulk came to be. He goes into more detail about a special project in WW2 and how it worked on only one test subject. He never actually says Cap's name but it's strongly implied. Ross: Things got complicated. We had to shut him down. Ross: We had to shut the project down. I had heard about the Captain America one awhile back. I want another X-Men movie and I want to see the Pheonix better realized. Simply giving Famke Jansen red hair sucked. I want to see the fiery bird. Yeah...that just...isn't going to happen. Sorry buddy. Why do you say that? Apparently, they did cheat and everything is not as final as it seems: the depowering of Magneto, the deaths of Xavier and Jean, etc. Nobody ever really dies in Marvel. Did a thing at work a few weeks ago... and I finally went to find the link again. Sam to play Nick Fury in NINE more films. Oh thank God. Last I heard, he was refusing to do any more films. It just wouldn't have been the same if he wasn't in them. 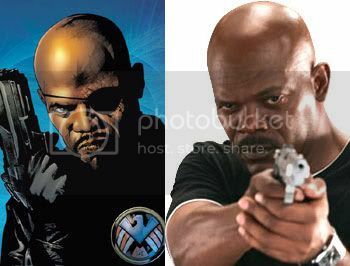 Especially considering they completely redesigned Nick Fury to look like him.